Bringing home oneâ€™s dinner, not bought in a store, but rather, provided by the bounty of Mother Nature takes skill and perseverance. Fishermen throw out lines to hook their supper or dive with spears to impale a nightâ€™s meal. It is with great pride that they clean and prepare their bounty earned through their cunning and sweat. I too have recently felt this pride. The wild coconut is more allusive than one may think. Coconuts still clinging to trees are too young and immature, lacking good meat. Most of the ones spotted on the ground have been breached, drained of their lifeâ€™s blood, too old and dry. Capturing the right coconut newly fallen from a mighty palm takes patience and determination. Finally, on a trek through ragged hurricane ruins on White Sound, I spied a coconut flourishing in this tiny window between too young and too late. The sweet meat of the coconut. He was a heavy nut with a thick husk. Greg wielded a cleaver and cut a great slit in the outer skin, which he peeled away. Once free of its protective cocoon Greg thrust a French knife into its shell creating a gash breaching the nut enough to be able to drain it of its sweet juice. 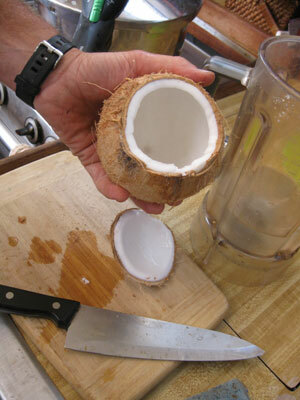 Almost 2 cups of water drained out of it before Greg slowly bore away its top revealing its creamy white flesh. We dug the meat out of the shell and transferred it to the blender, added most of the water and pureed it into a thick cream. I poured the mixture into a mesh bag â€“ and, using my bare hands, gently squeezed the thick milk into a container. Rich delicious wild coconut milk! It was so good. That night I made Belizean rice and beans with a half of a cup of the milk. The next day I made a cornmeal pudding with the remainder of this milk foraged and prepared with my own hands. Some are hunters, I, am the vegan gatherer. 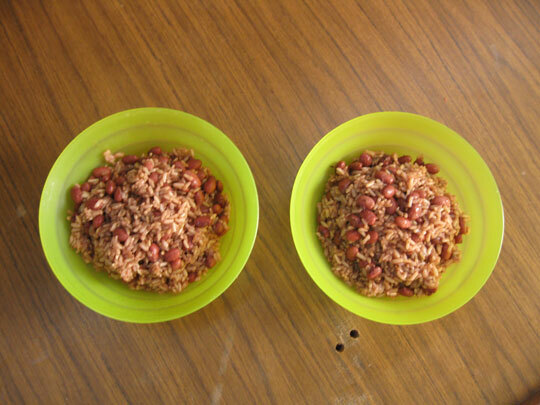 The result of our labor, Belizean rice and beans. 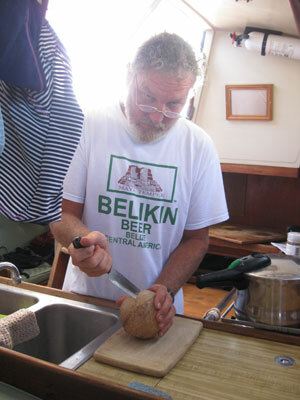 This entry was posted in Life on the Water, The Abacos, The Bahamas, The Galley. Bookmark the permalink. while greg’s efforts certainly did the trick here is a miami natives’ helpful hint for getting into a coconut the next time: after removing the husk you will notice 3 dark spots on one end of the nut itself, using hammer and screwdriver you can drive holes into these softer spots, easily drain the delicious coconut water into a glass and then throw the coconut onto the ground (asphalt or concrete or boat deck) as hard as you can until it splits into big pieces ready for the sweet meat to be scraped out. happy sailing! !